This thread has been sitting in the "drafts" section for a while now. According to this story in Yeshiva World there's a statement out by Rabbi Chaim Dovid Zwiebel, the Agudah counsel, about the city's plan to recognize domestic partnerships of alternative lifestyle couples. In other words "Faygelech" will be able to get married, or something to that effect, at least in New York City, and an opinion has been agreed upon by the leaders of the Moetzes. It seems from CDZ's words that he's of the opinion that we need to worry about non-Jews here too, and the effect that such unions will have on the non-Jewish children of such partnerships. I wonder why this is. Why - without the concept of LeSakeyn Oylum - why we need to worry about what Joe Goy does, and how his children may or may not be affected. I also wonder why we were always told - when the Rebbe would speak about how School Prayer is NOT Unconstitutional, and how the Supreme Court must allow it - that abolishing school player and effectively banishing G-d from Public Schools is not our concern, and we should not speak up about it. We were told to worry about our own children; that we had enough trouble caaring for our own, and that we needn't worry about maintaining a perfect world. Then again; maybe it all comes down to our children, not the perfect world, in which case CDZ is being untruthful by telling the media that he worries about children of such relationships. I think he worries - and maybe rightfully so, I'm not sure - that OUR children will begin to see such relationships as "normal," and begin to think that it is an "alternative lifestyle" for them too, in which case the foundations of our Chinuch system are on shakier ground than I thought. If all those precautions and Chumros and rules by the schools, and regulations how mothers are allowed to dress, and what's allowed as entertainment, and where the family's allowed to spend the summer, and where the children are allowed to attend summer camp; If all that won't be enough to keep our children - and ourselves - in check, then we're in a whole heap of trouble. I have just received a phone call from two Lubavitcher Chassidim in far-away Sydney Australia that they've taken it upon themselves to sponsor the two Sedorim in honor of Yud Aleph Nissan, the Rebbe's 105th Yom HoLedes. May Hashem repay their kindness, a hundred times over, and may we merit to eat the Korban Pesach with Moshiach in the Beis HaMikdosh Hashlishi. The Rebbe would always speak of bringing a "fifth son" to the Seder, the son that does not even know That he needs to join one. I think we may have ourselves a "sixth son"; one who knows about the Seder, but doesn't join for reasons we can surely understand. They're just not comfortable there. I asked one of the "chulent" members where he plans to spend the Sedorim, since I knew that he'd want to fulfill those Mitzvos BeHiddur. He told me that he had no place, since he wouldn't be comfortable at home with his parents, nor with any other family member. I asked him if he has a "leader" for the Seder, were he to make a group Chulent/7FC Seder, his answer was "Heshy." Heshy is a Williamsburg kid from a respectable Satmarer family who left for greener pastures. He's the unofficial Rebbe of the group, he'd be the leader. What about a place? He said they'd have a place if they had all the ingredients necessary for a traditional Seder. So here's the pitch: We'd like to organize a little fundraising drive here; we'd like for our readers to join together and make this Seder happen. All it takes is a few bucks from all of us and these young men and women would have the Seder mit alle Pitchivkes! Think of the Nachas Ruach you'd cause to Hashem to have him see his precious children join together and fulfill his holy will. Think of the joy this seder will bring by having Jews of all stripes - Willy, BP, Crown Heights etc. - join together in perfect harmony singing the praises of Hashem for all the miracles that he did and does, and it would be in your Zechus. So open your wallet just a wee bit and get in touch with Mr. Schonfeld, he'll arrange the rest of the shlepping and setting up so you won't have to. He can be reached at Isaac18@gmail.com. 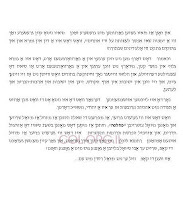 Then after Yom Tov iy"h we'll get a full report of the Chiddushim were said at the Seder. Thank You and G-d bless. Caring for the Rebbe's legacy. The point here is not to debate whether or not every Lubavitcher REALLY is a closet Meshichist waiting for the right moment to out himself. There's absolutely no point to that, in my humble opinion, simply because it makes no difference. DGMW, I despise Meshichism and all it entails, but all I see when it gets attacked by guys like Harry Maryles is what all of you see when you see a Grobbe Goy attacking Jews for being cheap or for ripping him off in business; an anti-Semite, plain and simple. Why? because he never misses an opportunity to attack, even when the details of the story are unclear to him, and even when he has absolutely no idea about the mindset and culture of the people he attacks. 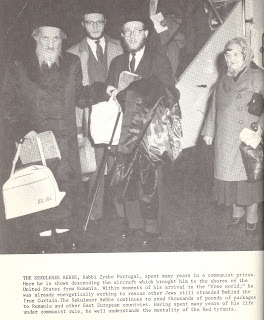 The previous Skulener Rebbe arriving from behind the Iron Curtain. The others featured in the photo are unknown to me, Maybe one of you can help us out? Photo courtesy of The Zeirei Forum. As usual; click on images to enlarge. It'll take you to esnips.com, where the image will be slightly larger. I couldn't upload them through blogger, for whatever reason, something's wrong with their uploading option. Recently the above publication was loaned to the Circus Tent in order to publicize its contents to our thousands of readers. We appreciate it, and thank the anonymous loaner for his help in spreading the truth all across blogosphere. In 1971 the movement to free Soviet Jewry was in full swing, at least amongst a large segment of the Jewish population. Activists such as Meir Kahane would harrass Soviet diplomats, and make theie life here a living hell. Large scale demonstrations took place in Washington, DC. and abroad, and all sorts of pressure was placed on all sorts of world leaders. The frum world was nowhere to be found when it came to these issues, and those who were active did not like it one bit. They accused them of not caring about the suffering of their brethren in the CCCP, something the frummies adamantly denied. "We have Da'as Torah, and that's who we follow," they said, and we have our own ways of caring about Russian Jews. Demonstrations, especially loud ones are only detrimental to the plight of our brethren, so we won't have any part of it. 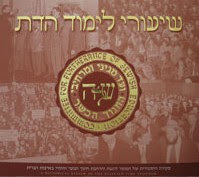 One of the publications put out to plead the cause of the frum was the above special edition of "The Tzeirei Forum" by the Zeirei Agudas Israel entitled "The Russian Jew," by a young team of Agudah writers and stam Yeshivishe guys who cared about their reputation and the reputation of their leaders. They banded together to put forth a response that would once and for all show the secular and Gentile world that we do have a voice and do speak up. 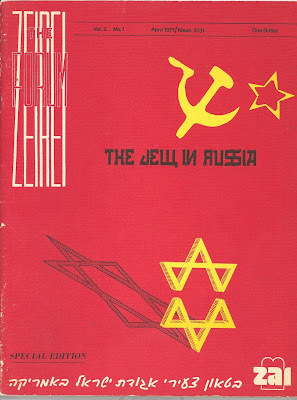 The booklet goes into great detail explaining the history of Russian Jewry since the rise of the Bolsheviks until today (1971). Was I surprised to see that much of what was written there seems to have come straight from the offices of 770 Eastern Parkway! Articles about the Mesiras Nefesh of the Frierdige Rebbe and his Chassidim, and the Rebbe's view on what should be done to free Russian Jews. All this in 1971, not 1951. What exactly changed from 1971 till, say, 1991? not much really. The Rebbe had made all the so-called sensational statements already, and the meetings with Shazar had taken place. The six-day war was proclaimed a miracle, and the Sichah of not sleeping in the Sukkah had been said that Tishrei. So what gives? Who in the American Agudah decided that Lubavitch and the Rebbe were to be marginalized? Or was it not the American branch that decided this? All this bears some investigating, IMHO. 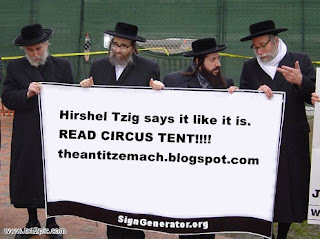 In the mean time take a look at these pages from the Tzeirei Forum. Today, nothing personifies Mesiras Nefesh like Reb Nissen Pinson in Tunis. Living in the former home to the PLO for close to 50 years has not been easy, especially with his health not being what it used to be, and age creeping up on him. Yet, he continues to provide services to the Hundreds of Jews still living in the Arab State, including these beautiful, big, round Matzos. I saw a blip in the JP that Mr. Sam Chanin, (Tchanin) aka Mule Chanin, (חאנין) made a Hachnosas Seyfer Teyreh on Wall Street some time ago. He helps disenfranchised youth by giving them skills and finding them jobs. He has a Shul there in the Wall Street area. Very nice. But what's with the "Schneerson Centers?" Why would a Lubavitcher Yungerman (albeit with a trimmed beard and named Sam) name his project like that? I don't think you'd see Teitelbaum Centers in Williamsburg, or Twersky Centers in New Square, now would you? I sent many of you an e-mail last night informing you of the latest post. What I did was CC all of the names, instead of BCC. Many of you were upset that I compromised your privacy, and rightfully so. Please accept my heartfelt apologies. The person responsible was terminated. A picture that should bring tears of joy to any parent's eyes, a father spending quality time with his young daughter, helping her with her Simchas Teyreh flag. But wait! what's this? Who are these western-looking gentlemen whose photos adorn the walls of their humble home? Are they Rabbonim? Roshei Yeshivah? Ayskim BeTzorchei Tzibbur? nooo! It's Sholem Aleykhem or some other Shvartz Yohr! Now why would a frum-looking Yid with a Bord un Kaften have such individuals as his role models? 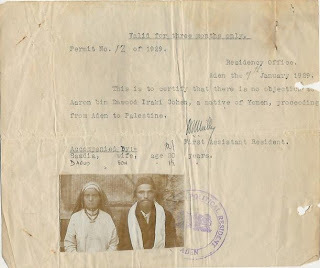 "There is a card with the photo of "Sholom Aleichem" (Rabinovich) on the wall. As far as I understood it depicts some scene from his books, that why his picture is there. Most probably, the designer wasn't frum. But he wanted his publishing house to cater to a wide variety of customers. At least part of maskilim of that time didn't have hateful feelings towards Yiddishkayt. They fell in the trap of Haskoloh, Communism or whatever else, but they still could have some (positive) sentiments and feelings (towards Yiddishkeit) I assume. It wasn't so black and white, like evrey Maskil being a hard-core hater of Yiddishkayt. Life was hard. It was like a Klipoh of Avoydoh Zoroh before. We can't really imagine how hard it was not to fall into it." I thank "A Yid" for the link. Recently two events thousands of miles away and seemingly unrelated came together to prove a point made 3 to 4 decades ago. If you're confused I'll explain. 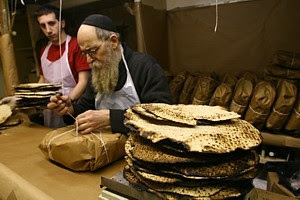 The Matzohs may be Mutter BeDieved according to some Shittos, and we may say they're Bottul BeRoyv, but who would want to use such Matzohs for his Kayreh at the Seder? It turns out that it was a libel created by her soon-to-be ex- husband who was looking to create trouble for his wife. A Document provided by the Shliach in Minsk later proved that she was Jewish. Meanwhile, across 2 oceans in Israel, a Bocher in a prestigious Jerusalem Yeshivah, a Bocher, whose mother wore a Tichel to her eyebrows, and whose family lived in the Torah'dike city of Kiryat Sefer, has been discovered to be a full-fledged Goy! He was engaged to be married to a nice Jewish girl too. The story first appeared last week in the Israeli newspaper HaTzofeh, and was picked up in In This HydePark conversation. It turns out that Chief Rabbi Goldschmidt of Moscow gave his family a certificate confirming their Jewishness, they must've duped him good. Somebody must've decided to make sure the Chossen was Jewish before they got married. ( I wonder why they didn't think of this earlier.) The whole family underwent a Kosher conversion after they were exposed, but the girl has changed her mind, she doesn't want a Russian Ger. The repercussions continued; as The Beis Din of Rav Nissim Karelitz was also implicated in this story, as they too confirmed the Jewishness of this family when they arrived in Israel. Maybe it was Al Smach Goldschmidt. The point here is not condemn Rav Nissim Karelitz, a Choshuver Rov, but to show how important MiHu YeHudi was and is now. Obviously Israel and the USA are quite different in this regard, in Israel all are considered Jewish, simply because they live in Di Yiddishe Medinah. In America people wouldn't take it for granted. 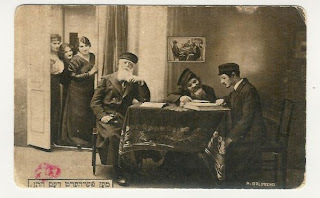 POLAND 1900's Picture postcard "Examining the Groom" - depicting the groom being examined prior to the decision whether the match is suitable. In the background are the bride and her sisters hiding behind the door and listening..
Verlag Jehudia Warschau [Warsaw]. fine condition - sides are slightly worn small stain on bottom right. It seems like the old-time Maskilim had a problem with almost every aspect of Jewish life back then, including examining the Bocher before agreeing to a Shidduch. I'm not quite sure what the problem is; after all, wouldn't you examine a horse before buying it from a pushy salesman singing its praises, so why would a husband for your daughter be any less important? Your take on Skver is remarkably trite, with an odd udercurrent of irrational dislike. Skver has many problems, some unique to their community, some in common with other Chasidim/Charedim. But you mentioned very few substantive issues. The way you protray it, you'd attribute no merit at all to a community that is--as a whole--largely devoted to higher ideals of Yiddishkeit. Skver has committed some egregious blunders over the years, and the leadership has shown itself quite myopic in many respects. The PELL grant fraud was one such instance. 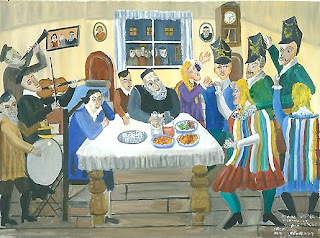 In addition, the Skverer Rebbe and his sons are extremely insecure--an insecurity shaped and fostered historically by aides committed to delusional visions of grandeur for the community--and they fear loss of control to the slightest degree, which impels the imposition of draconian ordinances to reinforce the community's homogeneity. But none of this discounts from the remarkable fact that Skver has managed to sustain a core of yingeleit and bachurim who are committed to "avodas hachasidus" as very few other communities in the U.S. Contrary to your outright ignorant assertion, the shtetl was not built for housing purposes. The previous Skverer Rebbe had a vision for establishing a community that would mirror that in which he was raised in Eastern Europe. His stated motive was to build a shtetl "vie es velen oifvaksen yingerleit mit pnimius." For you to doubt that fact is to know absolutely nothing about its founder and his legacy. You might find ome Netflix customers in NS. You'll certainly find plenty of residents swept into 21st century materialism on par with the best (or worst) in BP, with their Lexus SUVs and their complete disregard for matters spiritual. Heck, nowadays I wouldn't be surprised to find a TV or two. But the overall atmosphere in NS is by far one of living simply and being dedicated to ideals of Torah and chasidus--Chabad's patronizing moniker of "poilesher chasidus" notwithstanding. Skver has its challenges, no doubt. And perhaps they're at times over-romanticized by their sympathizers. But the problems aren't the boots or the gender-separated streets or the Netflix customers. It's most significant shortcoming is a failure of vision to re-imagine their ideals in the face of 21st century challenges; a problem for which, it just so happens, few other charedi communities have proven any better. I wish I had a "Chulent"
Ever since I linked to that NYT article about the Chulent gatherings of the disenfranchised in Manhattan I've been accused of being insensitive, overreacting, and everything in between when it comes to accepting those that choose to live life outside the realm of Frum society. They tell me that I don't understand how difficult it is for some kids growing up in Boro Park, Williamsburg, and Crown Heights, who think differently than the mainstream and cannot voice their opinions. "This is their only avenue of getting what they have off their chest," they say, and you just don't get it. Believe me, I sure as heck can relate to that, I've been running from society my whole life, and in some ways I'm still running. I know and understand the need to get together with other like-minded people and just talk about nothing, I just wish I could find that group. Just going to the same Rebbe or Yeshivah doesn't mean you think alike, thus you may still be lacking that camaraderie you so desire, no matter which group you may join. Many of the people who I see in the pictures there on Purim have ben abandoned by society; they've been forgotten by their peers who now have families, simply because those people have families and jobs to worry about. That leaves little time for old friends who still need to be hooked up, and those friends resent it. That's not to say that we can wipe our hands clean of our responsibility to these young men and women, but it's tough to be an employee, husband/wife, and father/mother, and at the same time still worry about old friends. Something's gotta give, and usually the friends are the ones left out. When you're in that kind of situation you aren't very understanding anymore, and you need to find companionship somewhere. Gatherings like these are the perfect solution. Back to the Chulenters: We can see that society has failed these people; We just don't know if society's very upset about it. Most people you speak to will give you the built-in excuse that every society has such misfits that'll never fit in, and nothing we can do will stop it. If we're super nice they'll just say that we're insincere. If not, then we're just a bunch of no-good bums. Often times it's the family situation that causes these youngsters, and not so youngsters, to drop out, and they'll build a case against society for not being there for them. Every person I know that was featured in the NYT article falls into one of these few categories. It's that family support, and the strong foundation at home that keeps people, inquisitive and non-conformists as well, in check and in the fold. Were it not for strong, close-knit families the dropout rates would be exponentially greater. It seems like Chabad-bashing doesn't go over very well in Israel, so Aish ran this beautiful article, singing the praises of Chabad in Nepal, and the great public Seder they organize for the masses of Israeli backpackers that travel there. I guess I should be happy about this. My grandmother's Yohrtzeit was on 27 Adar, this past Shabbos. With this week being Shabbos Mevorchim, and Chof Zayin Adar to boot, maybe it didn't get the attention it deserved from me. My Bubbe was born on 27 Adar 5674 (1914) in the town of Sajoszenpeter, Hungary, just outside Miskolc. Her father, pictured above in Tzilinder, frock, and white gloves, was a Talmid of the Shevet Sofer in Pressburg, and received Semichah from him. Her parents married in 1902, and this is the picture they took for that occassion. They traveled to Miskolc, and had their picture taken looking like a royal couple. He was Niftar in 1924, when the Bubbe was only 9 years old. Four years later, after suffering for years, her mother also passed away, and the Bubbe was left alone with her sisters and brother. In other places a Kaylichdige Ye'someh would have found consolation in the movements of the time, or even would have left Yiddishkeit for good, but not her. The Bubbe was raised by her sister, not in Bais Yaakov or Bais Rivkah, attending state schools her whole life, but she put any of today's girls to shame. She married my Zeide, a local man, in 1942. The Zeide was soon after "inducted" into forced labor for the Hungarian army, and was taken as far as Vitebsk, Belarus, which is where the connection to Chabad probably started. (kidding.) During the war the Bubbe and her husband's sister were taken deep into Poland and were put to work making bombs for the Germans in Leiptzig, among other places. They were prime targets, as allied bombers bombed the dickens out of the German war machine. Miraculously they survived. 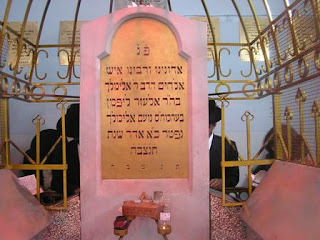 After the war the Bubbe went to the Tziyun of Reb Levi Yitzchok in Berditchev to pray for the safe return of the Zeide. There she overheard some Jewish soldiers conversing in Hungarian, and asked one of them if he knows anything about other Jewish Hungarian soldiers who may have survived. he did better than that, he told her that her husband went back home, and that she should go there and meet him! 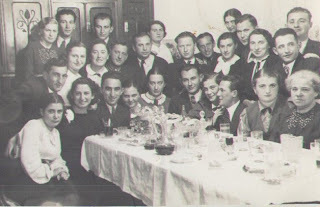 My zeide and bubbe were the Unterfihrer for most couples rebuilding their lives after WW2. Three years later they were on their way to America, first settling in upstate New York, as my zeide got his visa based on the fact that he was a farmer, and then two years later on to Chicago, where the bubbe had a brother living there. Despite her lack of Jewish education, and despite the fact that there many Chassidim and Yeshiva'leit from Europe's finest Yeshivos, there too, the bubbe was the only one who covered her hair at all times. There were others there who were bigger Talmidei Chachomim than the zeide, and who wore fur hats on Shabbos and Yom Tov, but their wives somehow weren't part of their Chassidishkeit. They looked like any other women on the street. I'm proud of that fact. I guess we need to chalk up that fact to her fine Ashkenezishe upbringing, with no Chochmes, just the basics. Her devotion to G-d and Yiddishkeit never waned. After zeide passed away many years ago she moved to New York to be closer to the only family she had. That's where I saw what an emese Yiddene is like. She lived next door to a shul, and would daven with a minyan three times a day, that's more than I can say for myself. She cared for elderly women younger than her who were disabled by disease, caring for them like she would for her own mother. She fasted on every Yohrtzeit of every single family member, including her parents and her sisters, who perished at Auschwitz, until her dying day, no matter the time of year. Every spare moment was spent uttering words of Tehillim, and reading Tze'enah U'Re'enah (in Hungarian of course :-). The Eybershter was Memaleh her years, and she passed away on her 86th birthday, BeMisas Neshikah on her den couch, waiting for her supper to cook. She was healthy and strong to her last breath. We miss you terribly באבי, even after all these years. Has anybody else seen LAST week's English HaModia magazine cover story? it's not the Sunday NYT, but it still bears discussing a bit. They discuss the Village of New Square, dubbing it an "American Shtetl," waxing poetic about a village that's really consumed by poverty, corruption, and lack of values. They see it as some kind of utopia, where all people grow up innocent and pure, and all they ever know is Washington Avenue (where the main shul is) and Skverrer K'peydes. While it's true that it's an American Shtetl, I'm not quite sure the rest of us who live in the terrible "big city" (as if Boro Park and Willy are big city) need to feel so bad that we didn't see the terrible danger we're all in. After all, the Satmar Rov was just as frum as the Skverrer Rebbe, and the only reason they went upstate was for lack of housing, not the imminent danger the city posed. The HaModia looks at a village where all streets are a dead end, and they see opportunity and light. If you think Sue Fishkoff was a K'deysha (to quote those other blogs) then she doesn't hold a candle to the HaModia. The parts where they discuss the history of the village were sort of interesting, until they made the fact that had unpaved roads in the beginning some sort of Mesiras Nefesh. I guess every Yid that lived in Kfar Chabad is on Mesiras Nefesh too, because there were no paved roads? You read the article and you're told that all there is in NS is Torah, Chesed, (evrybody bakes cake for each other) and Rebbe. The Rebbe goes to every Upsheren and Bris, and each Yungerman looks forward to the Tishen every week, his eyes transfixed on the Rebbe's every move. What we really have is an upstate ghetto of the worst kind. A mass of people, 95% of whom don't work, and have no skills whatsoever. Not having skills would not make them any different than any other Frum group, and wouldn't make it so terrible, but this is different. The cloistered living makes it even worse, with them having little interaction even with the rest of the Chassidishe world. The fruits of this lifestyle are everywhere, and they're no good. The living, which I assume was supposed to be one of clean air and wide open living, has become reminiscent of some of the worst cluttered living known in the United States. Illegal apartments one after the other, with 5-6 families living in what was zoned to be a one family home, and overpopulation of those already tight spaces. Is all this worth it just to be away from Boro Park and Williamsburg? If only the parts hwere they speak of the devotion to the Rebbe would be half true. Yes, Skverrer Chassidim are very big Mekushorim, and they have Mesiras Nefesh to wear those boots in 100 degree weather just because their Rebbe does. But not for nothing do they say that New Square is the only place outside of Cuba and North Korea that has full-blown Communism these days. Attendance at all davenen and Tischen are mandatory, even if they start at eleven and last for hours. 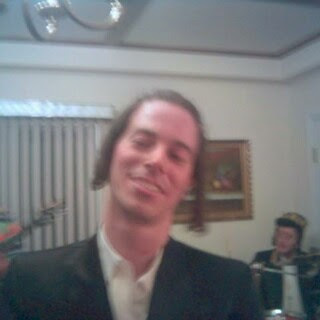 Haircuts must be taken only at prescribed times, a Simchah is the only exception. They had this genius idea to have separate sides for men and women on those tiny streets, and did I mention it's a dead-end town? Every day tens of people from such places as the Five Towns and Teaneck pull up with their fancy cars and well-dressed occupants coming to see the Rebbe to discuss some important business or medical matter, leaving litle time for the distressed locals to discuss their issues with their beloved Rebbe. I also don't buy the nonsense of the palpable Kedushah everpresent in New Square. The houses not having mirrors, even for the women, and that nobody owns a radio there. Let's go and ask the mailman there how many red envelopes (Netflix, anyone?) he delivers there and the cable guy how many houses are hooked up for broadbad and such. Yes, I know all about Crown Heights. I guess the HaModia wasn't exposed to that side, eh? All they saw was happy kids riding big wheels, and women baking cakes for another Kiddush being held this Shabbos. Some job this repoterette did, she'd be without a job if I was running the paper. Was it the same night that he did Tshuveh?! Did he go there for one last hurrah? I recognize some other faces there, I would have never guessed, not in a million years. I guess you never can tell about some people. I feel their pain, I really do, I just think there are better, more Kosher ways to vent. An interesting combination, indeed. Ay, The Meharer Acharei Rabboy that must've been going on there at that time! I guess what we can learn from this blurb is that it all depends who does what. The Brisker may be totally insincere about his stutter in Krias Shema, yet he's considered a Medakdek B'Mitzvos even though he may be being Over a Halochoh in Shulchan Aruch. The Breslover Baal Tshuveh, who was taught the Na-nach mantra, and considers it to be a direct line to Reb Nachman and G-d, is looked at like some kind of looney in a drug-induced haze. a Former Novardhoker tells us how it was in the old days. I guess he forgot what they taught him there, eh? "We would go to a pharmacy and request nails, or ask for butter at a haberdashery, in order to get used to not being ashamed. Or we would do things to 'break our will' - we would get meat and potatoes for lunch, and we were supposed to eat the potato and leave the meat." The most extreme yeshiva was Novardok. This, no doubt, was due to the personality of its founder, Rabbi Yosef Yoizel Horowitz. In his youth, he was considered a rascal who was often truant, but a chance meeting with Rabbi Salanter (at a relatively late age, when he was already married) led him to leave his family and business and devote himself to studying Torah and morals - despite the vociferous objections of his father and the rabbi. After his wife died, he became even more ascetic. He sent his children to live with other families and became a hermit in the home of a tinsmith, who supplied all his needs. For a year and half, he did not leave his room, not even to go to the synagogue - he observed all the religious precepts there, even blowing the shofar on the Jewish New Year by himself. Eventually he married the tinsmith's daughter, and only later was he persuaded to spread his doctrine through a yeshiva. I now see that mentalblog has something on Novardok now too. Wasn't he supposed to be on break? again? I couldn't think of a name for this post, so I named it so. I also can already see the morons crawling out of the woodwork on this, but on Berl's advice I'll "comment-mine" it. I'm more concerned with the constant references to Shabse Tzvi. There is a phenomenon I've observed for a long time - the creation of a mythical SZ to replace the actual historical one. In the myth, SZ is classed primarily not as a rosho who deliberately transgressed issurim de'oraisa, lehach'is and not lete'ovon; not as someone who made a shita of plumbing the depths of tum'ah and dragged thousands of Jews with him; not as a meshumad and mechalel shem shomayim borabim; but as a "false messiah". Yes, SZ did claim to be the Moshiach, and yes, that claim was false. He also ate chicken, and yet we don't classify him primarily as a "chicken eater". He was a Romaniote, which is at least somewhat interesting and unusual, but we don't classify him primarily as that. The reason for classifying him primarily as a "false messiah" is not innocent - it was a deliberate (and unfortunately successful) attempt to infiltrate into the Jewish consciousness the idea that there is something wrong with "false messiahs", that to make a claim of messiahhood and to fail is a stain on ones character, or even some sort of averah. And therefore since every person who has so far made such claims has failed at bringing them into fruition, they are all to be reviled and compared to SZ Yimach Shemo. I'm not sure exactly who started this insidious propaganda; I greatly suspect that it was the maskilim in the 19th century. Their object would have been to cool people off the entire idea of Moshiach, and to intimidate anyone who showed signs of perhaps being the One from exploring his potential, for fear of becoming "another SZ", chas vesholom. Who knows whether there was perhaps someone who could really have brought the geulah, had he tried, but was discouraged from the attempt by this meme. Maybe we could have been spared the suffering of the 1940s! Accompanied by his wife Sa'adia (isn't that a man's name? or is it pronounced differently?) and son Daoud. They left from Aden in January of 1929 on the way to Palestine. I wonder what happened to Aaron and his family, it's not that long ago and shouldn't be THAT difficult to trace. Why is he Dawood and his son Daoud, is that a different name? All that land from Aden to Palestine was under British Mandate/Protectorate then, so all they needed was one permit to travel all that distance. Anyway, Aaron's permit Is up for auction. For 175 dollars it's yours. In the interest of equal time we present to you - in the form of a "comment mine" -the response to Zezmir's Natan Slifkin loses an admirer." Natan Slifkin here. I have to tell you, I myself hated the Prager interview. I was totally unprepared for the rapid pace of the questions and the minimal time that I was given for responses. That kind of topic is way too complex for me to be able to give two-second sound bites off-the-cuff. I did not present my approach accurately and I regret the interview immensely. But I have no idea what you mean about my being intellectually dishonest or presenting my own opinion as fact. Of course I believe the truth of my own opinions, that's why I formed them! But in my books I always make it completely clear that other opinions exist. If you believe that I have done otherwise, please cite examples. And I never pass off my personal interpretation of an authority as his unequivocal position where I am aware of scholars that have a different understanding. If you believe that I have done otherwise, please cite examples. Something that frustrates me is when people say "But he's not an authority in science etc." I never present my approach on the strength of personal authority, but rather on the strength of the arguments themselves. Yet people seem to be reluctant to actually cite anything from my books to back up their charges. Funny and true story - there was one person who kept on insisting that I speak disrespectfully about Chazal. When he was pushed to actually cite an example, he dodged and dodged, and finally came up with the fact that I accept evolution! I'm glad to listen to criticisms of my work and correct it where appropriate - but some people are clearly trying to dress up their religious objections to modern science as being something else. 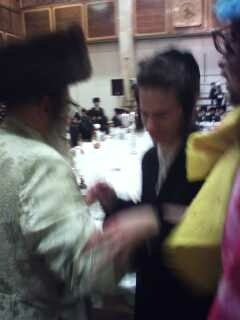 On Purim this year an interesting transformation took place at the Satmar Rebbe's tisch in Kiryas Joel. A young man with long hair originally from KJ, who had lost his way and left Yiddishkeit, showed up at the Tish and was summoned over to the head by the Satmar Rebbe. He spoke to the young man for ten minutes and then asked for a hair clipper. He then proceeded to shave his head in front of the thousands in attendance! The Peyos were already there due to the long hair, so the kid was instantly transformed from what the locals would call a "Goy" to a regular Satmarer Bochur, Tallis Koton, white shirt and all! it may be, and especially a controversial figure like Reb Aron T'baum, will undo all those years of turmoil that this kid has gone through. Yes, Amnon Yitzchak does it all the time, but he does it with people who are sick of the Israeli secular culture, and are looking for a fresh start. They're also more open to religion and tradition in the first place. This kid has much fun left in him, I doubt he's sick of the pop culture world yet, he can live it up for many more years before he gets tired. Does he make this transformation last? or were we duped by this dude big time? Hirshel: Let me begin by saying that I like Rabbi Slifkin. I have a few of his books and I think he's a well meaning fellow; I am especially drawn to defend him and his right to be a thinking man. That said, I listened to his interview with Dennis Prager in August of '06 and was pretty disappointed . He was asked among other things by the interviewer - DP - a believer, if he believed in creation the way it's presented in the Bible, if he believed in the Exodus, and if he believed in Evolution. I cringed at his floundering under question by Christian fundamentalists and others – he seemed completely out of his depth, and in fact I got the impression that Dennis Prager himself might be more competent in this area than Rabbi Slifkin. It also reinforced something that I began to see in his last two books: he is increasingly intellectually dishonest (albeit perhaps well-meant) and takes his opponents criticisms (perhaps somewhat understandably) too personally. His oversimplifications, and his propensity for only telling one side of the story (his view) is, simply put, poor scholarship. And that's the point – he's not a scholar. It seems to me that Rabbi Slifkin is another layman that – like many more modern thinkers – feels the need to deal with their conflicts, and find a way to navigate the terrain of Torah & Chazal vs. Science & secular thinking while splitting the difference. That's fine, and I have no problem with it on personal level. Every individual is entitled to find themselves and think things out; it's a noble and important process that is essential to the human spirit. But when someone writes a book or goes on a lecture tour, etc – i.e. 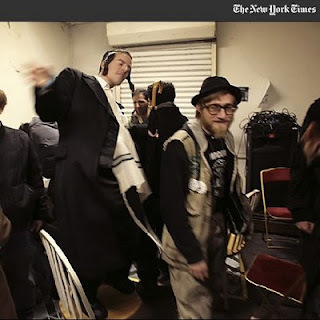 he goes out in public to represent Yiddishkeit – that's where things change. It is irresponsible for someone to make statements that aren't carefully worked out and remain quite ambiguous; moreover, it is irresponsible to express an opinion as a fact. A scholar cannot put words in the mouths of others, even if he infers that his understanding is what that other was alluding to. All of this is especially problematic when a rabbi gives credence to questions and then comes back with answers are weak and incomplete, leaving the reader/listener in the unenviable position of problems that are stronger than the answers (and answers that address one problem while creating another). I wish him well, but, as much as I wanted to be a member of the Slifkin support club, I just don't think I can do so anymore. We hardly knew ya, Natan. If you read Jewish newspapers you must've seen the ads trumpeting an upcoming conference that'll "change the face of Kiruv." The ads say very little about what it's about. Who'll be included in this conference? What will they do that hasn't been done yet? I ask, I do not know. Churchill says the Jews are to blame for Anti-Semitism! At least partially, that is. So scream the headlines today. 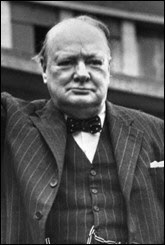 They're based on recently discovered memoirs written by Sir Winston in 1937 where he basically says that based on the fact that they're hated everywhere, even in countries like the US and England, where they have equal rights and opportunities, we can see that they're partially to blame. They stick out too much, they don't become part of society. They keep their own rules and traditions, even when benefiting from the bounty of that society, no wonder they're hated, the man who would be Prime Minister said. On the advice of an advisor the article was stashed and not printed. It was found by a researcher who publicized it now, probably to tarnish the image of the man voted the greatest Briton of alll time by the English in 2002. Churchill was a good man, and obviously nothing more should be expected from a Gentile at a time when Jewish blood was cheap. He's no worse than the Jews, good well-meaning Heimishe Jews, who were quick to blame Ari Halberstam hy"d for being shot on the Brooklyn Bridge on that fateful Adar morning. "Why do they have to have those hats and beards and walk around all messy, don't they know that they "Reitz Ohn" the Goyim?! That's right, friends, the multi-million dollar homes, luxury cars, and fur coats don't provoke downtrodden non-Jews, no sireee Bob, it's the scruffy beards on that darned Lubabs! I remember as a Bochur of some 17-18 years old, I would daven at a Boro Park Minyan every morning before Yeshivah, and would very often be the Chazzan, for lack of another. On one 21 Adar I approached the Amud and davened. The tray of candles that are lit for Yohrtzeits was especially packed that day, and the melting wax would've made for a great picture, had somebody brought a camera. When I finished Chazoras HaShat"z I started Elokeinu Veilokei Avoiseinu, just like any other day. There were some shouts of "Yisgadal!" and "Rebbe Reb Meilech's Yoortzat!," but I continued, and ignored the pleas of those wishing to cut davening a bit short that day. I guess I always have a ruthless, mean streak to me. After Davenen was over, and I was putting my Tefillin away, I was approached by a Chassidic Young man, who knew my connection to Lubavitch and did not like it one bit, who asked me "Hayetoochen hust gezoogt Tachnin oyf di Rebbe Reb Mylich's Yoortzat?" My response was that in Chabad zoogt men Tachnin afille ba di eigene Rebbes, MiKol SheKein ba di Rebbe Reb Mylich. The man flew into a rage, demanding an apology from me for the "disrespect" I showed to the RRM by saying that he was not from the Eygene Rebbes. "He's the Rebbe of all of Klal Yisroel," was his cry, and that includes you! I ignored his further questions, and left the shul, already late for Yeshivah. Now, Imagine if I would demand that on 24 Teves that all shuls in Boro Park and Williamsburg refrain from saying Tachnun, would this Yid agree with my demand? This was not a Lizhensker shul, and as such should not have been conducting itself according to Lizhensker customs, so why was I supposed to not say Tachnun that day? Where would this end anyway? Would the Satmarer Chossid, and there are many in that shul, be allowed to rip Tachnun out of the 26 Av (Reb Yoel's Yohrtzeit) davenen just because he wants to? Am I to be reprimanded in public for sticking with the Shulchan Aruch and asking Hashem for forgiveness for my sins on this auspicious day? The Released Time Program, founded by the Frierdiker Rebbe under the auspices of the National Committee for the Furtherance of Jewish Education and Merkos L’Inyonei Chinuch, boasts a rich, informative and fascinating history. This unique undertaking has positively impacted the Jewish identity and observance level of tens of thousands of children in the New York public school system over a period of 65 years. We now have the privilege of presenting a magnificent Hebrew volume which details the proud history of this vibrant project. Featuring instructive talks and letters of the Rebbes, historic documents, personal essays and mesmerizing photos, this absorbing book requires willpower to put down once opened. As beautiful on the coffee table as it is suitable for study, here is the perfect gift volume, for yourself and a friend. I may not agree with some of the big Aveiros mentioned here, and some of the images are highly inappropriate, but for the most part the message is a very true one. Kids do to their peers as is done to them. I wish there was some class we could all attend that would teach young men - and young women - to raise children properly. We often tend to reprimand when not necessary, and overreact when positive reinforcement is all that's necessary. This Rabbi (Yitzchok Adlerstein?) 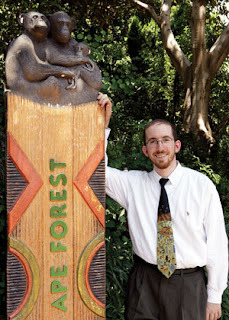 is clean shaven with a tie and respects secular scientists/science to the same degree as he does talmiday chachomim. 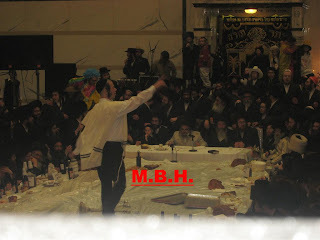 He is not completely subservient to Halacha/torah/tradition in the way that an ideal chosid or rosh yeshiva would be....his lot is not primarily within a Jewish society...his lot is with his intellect.......he is not risking anything by floating theories, on the contrary, he is becoming a bit famous. He quotes anonymous Rabbis. This is the very silly. If he was a chosid, with a beard, and he was a conventional guy with a family within some sort of chareidi context (belonging to a society) i could embrace his opinions (which intellectually make sence already). Also, as the Rabbi described this elephant jumping, I went back and forth,,,, in my anticipation of where this dialogue would go jumping or not jumping and what tosfos meant. This Rabbi took it as far as he could logically but that doesn't mean that his conclusion is the only logical end of this 'thread'. So really, no answer that he posits is necessarily the final answer. 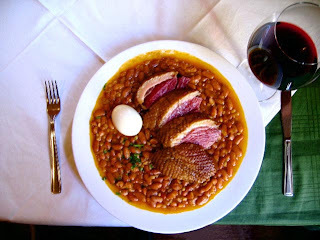 It seems that in the cholent of life and history and Torah there are a handful of random tiny particulars of something that appears to be treif at worst like jumping elephants. It doesn't seem logical to feel threatened by this on the level of learning, nor is it something that should unseat anyone's Yiddishkeit, learning, Yiras shomayim. Nevertheless, if this Rabbi assembles a book detailing these seeming 'inconsistencies', the tiny particulars massed together then seem to embody a really treif cholent, despite them being completely botil in the context of life and torah. If the book is available for scholar types, i don't see it as a problem nor would i have a problem with the Rabbi. But if its created for the masses , I believe the Rabbi is serving himself rather than truth, G-d, or the Jewish people, and skewing the torah for his own notoriety. Shimshon could push the envelope like no one else in Chabad when it came to social conventions, and no one minded cause of his great big heart. Shimshon was known to scream when collecting for Chevra Simchas Shabbos v'Yom Tov, shoving his cardboard box into men's faces in 770 saying things like, 'I know you made alot of gelt in the stock market this year, you can give more than that! ', or "Give! It's for the people!". He could be a mischevious but harmless flirt, calling the women his 'girlfriends', but never, ever meaning it as anything but ahavas yisroel and no one took it in a bad way, but in a fun way. He would sit in the evenings at his kitchen table answering phone call after call of pleas for all kinds of help. In a typical evening he would be finding a place to live for a battered woman, answering investment questions, offering shidduchium, marriage counseling, and telling off community members whom he felt had done the wrong thing, always with a gleam of humour and love in his eye, often times yelling, but never harshly, and never uttering a complaint that the burden was too great. When I was single he once offered me a shidduch with someone from out-of-state, and I refused because I said I wouldn't move outside New York. 'What is wrong with the women today?," he commented, 'you go wherever your husband has a Parnossoh!" 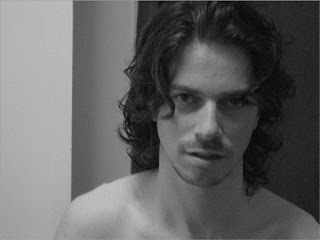 That was Shimshon, he never minced words, never held back his strong opinions, and he was totally and utterly selfless. And who can forget the time he said to the Rebbe at the dollar line, (paraphrasing) 'Rebbe, you have to take care of your health, what would we all do if something should happen to you?" to which the Rebbe replied as he gestured towards Heaven with his finger, 'You have Hashem." 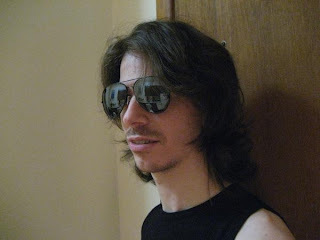 Shimshon's inimitable ways can never be duplicated and it was a privlege to have known him. I can picture him dancing with the Rebbe right now, with his cap, and his big smile. Oh, how he will be missed! Since we spoke last the Chabad community has lost three very different of it's finest. 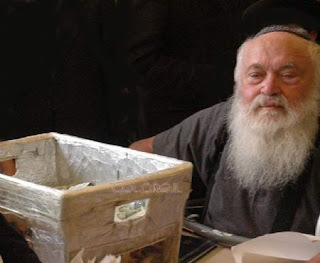 HaRav Reb Yitzchok Hendel passed away on Friday. He had some year this past year, losing his daughter, wife, and grandson. He was from the Peylishe Tmimim in Otwock that arrived in America through Shanghai and was soon after dispatched by the Frierdige Rebbe to Montreal, where he was a member of the Beis Din there, and Rov of the Lubavitcher Community. In the above photo he's standing third from right. Also pictured are Reb Chatshe Feigin and Reb Yudel Eber Hy"d.
This morning, while languishing in bed with a hangover, my wife informed me that Shimshon Stock left this world on Purim. 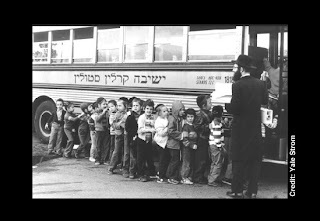 I also remember Shimshon from times like Selichos by the Rebbe, with his box in hand screaming for donations to CSSYT. What I didn't know was how he helped out families with things like Shidduchim and Sholom Bayis, and leaves countless families grieving. The fact that mentalblog reported on his passing says a lot to me. I would guess that Shimshon tried to help Tzemach too. He may have seemed a little rough around the edges, but he was all mush inside. And now, after finally recovering from Purim and getting back to work, I boot up the computer and learn that Reb Sholom Chaskind died today. 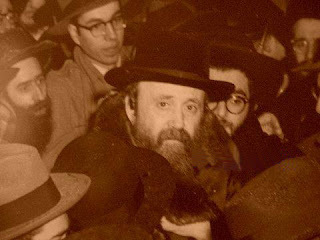 RSC was the son of Reb Berel Chaskind, pictured here behind the Frierdige Rebbe and his future Mechutan, the Rashag. Sholom's sister married the Frierdige Rebbe's Eynikel, and no, I don't know if he spoke to her all these years. Reb Sholom lived in Tel Aviv and was interviewed on the Early Years series by JEM. Chabakuk Elisha: Vashti's Tail and other tales. The Gemara tells us that Vashti didn't come when Achashverosh caller her because she was embarrassed – she had A) broken out in pimples, or B) sprouted a tail. This ultimately led her death for refusing the king. A couple days ago a fellow asked me what I thought about Vashti's tail – did I believe that she really sprouted this appendage? "Well," I said, "if I believe G-d can do things like create the universe or split the Yam Suf, is it so crazy for him to provide some Babylonian/Persian frau a tail?" "It's just too far fetched to me," he said. I responded, "You know it doesn't say that it was an alligator-tail or a shaggy-dog-tail or even a rat tail; for all we know, the "tail" could have been a small protrusion where a tail would be." "Good point," he said, "I can live with that." 1. A teacher who described her theory and method for teaching midrashim – a thoughtful piece but I wasn't so taken by it. 2. An article by R' Adlerstein . This one was compelling: First of all, quoting the Maharal carries some weight – if HE doesn't accept Vashti's tail as literal, he has my attention. So, by the end of this essay I was a new member to the club of those who don't necessarily take the literal view of Vashti's tail. I asked my wife about Vashti's tail, and she gave me one of "you better not start with your enlightened views again" look. But my fourteen year old son was walking by and said, "Everyone knows she grew a tail, what's the problem?" My 11 year old daughter piped up, "Of course she had a tail!" So I had three of them staring me down and I say, "But don't we say that the miracles of Purim were hidden?" Silence (I knew I had 'em beat then). "Thats a good question" my son says. So, I proceed to tell them that the Maharal makes the point, and in that moment I had 'em running from the literal interpretation like they had never considered it to be a real tail. So, why am I troubled? Well, because I'm a bit torn here. Maybe I'm wrong about this, but even if less literal interpretations of Chazal work for me, what about the future? The chareidi & chassidishe view on Chazal is to err on the literal side. And this is for good reason – there is a real risk of eroding the basic emunas chachomim and emunas haTorah when we open Chazal up for debate. The message it sends is that we are the arbiters that decide which chalakim of our mesora to accept of reject, which is a risky business. It seems pretty clear to me that the simple fact is that the more rationalist view is less successful in maintaining a strong Yiddishkeit – which is essential to the future of Klal Yisroel. The battles between the haskola and the chareidi worlds clearly show that the more we open up mesora for dissection & reevaluation, the more we doom ourselves to a slide away from Torah. 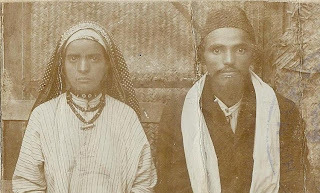 Most maskilim were frumme Yidden, but their path was a ticket to eventual assimilation, while the "small-minded, Pesi Ya'amin lechl dovor" chareidim maintained a kedusha and yiddishkeit that we can only wax nostalgic about. 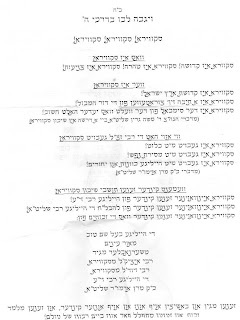 There is no end to this; once we open everything up we are left wondering about everything in Yiddishkeit. Did Purim happen? Did Pesach happen? If we put everything under the spotlight, we end up going around in circles in the dark, ultimately leading nowhere. So, what is the right balance? In Yiddishkeit we have lists of stories (from recent to ancient), midrashim and bits of information that are dubious, even our dating of history is almost surely wrong, so where do we stand? To me it seems that we need to split the difference. I take the position that we take Chazal and our mesora – our version of yiddishkeit – with a presumed benefit of the doubt. Then we need to work on a case to case basis: If we are faced with an irreconcilable conflict, we may take a different view than main-stream Yiddishkeit; if we have gedolei olam (the Maharal for example) that take a non-literal view, than we can adopt that position – but not on our own. Basically it comes down to the famous Chazal where Moshe Rabbeinu sees Rabbi Akiva teaching the secrets of the crowns on the Osios haTorah. Moshe becomes overwhelmed and asks R' Akiva, "Where do you know this from?!" To which R' Akiva says, "Everything comes from our Master Moshe" – and Moshe Rabbeinu is placated. Why is he placated? Not because Moshe Rabbeinu needs to feel proud that he gets credit, rather it's because R' Akiva is saying, "I do not rely on myself to interpret; I base it on the giants that came before me.